Away is set in Australia in 1967–8. Students will need to be aware of this context to more fully understand the meaning of the play. Read and discuss page xi of May-Brit Akerholt’s introduction to the play in the Currency edition (1988). In groups, students are to research significant events and social life in Australia in 1967–8. Information should be presented in the form of a collage, including photos and other graphics, newspaper headlines and snippets of information. The main characters in this text are teenagers aged about 15–17. Their parents are presumably aged about 40. Ask students what generations in Australia today is the play specifically about. Students are to research the meaning of generation gap, a term popularised in the Western world in the 1960s, and discuss: Why was the generation gap so significant at this time? Is it as significant today? In what ways was 1967–8 a time of change in Australian history? 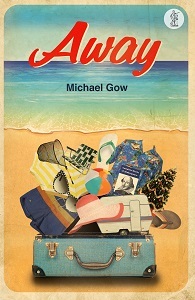 Away was written by Australian playwright Michael Gow. It was first published and produced in 1986. Students will need to understand that although the play is set in 1967–8 it was written from a 1980s perspective, and that they are viewing the play from another perspective again. Ask one half of the class to research significant events and social life in Australia in 1986, presenting information in a collage format, as described above for the 1967–8 activity. Ask the other half of the class to research significant events and social life in Australia today (i.e. over the past twelve months) and also present this in collage format. Students are to compare the collages for 1967–8 and 1986. What similarities and differences do they notice between the time period in which the play is set and the time period in which it was written? Can they explain why Gow set his play in the earlier period? Students should note that Gow was born in 1955 and would have been close to the age of Tom and Meg at the time the play is set. Is he looking back on this earlier time period with nostalgia? Or do you think he has represented the time setting of the play realistically? Students are to compare the collages for 1986 and today. What similarities and differences do they notice between the time period in which the play was written and students’ context of today? Do they think audiences today might look at the 1960s differently to audiences in the time the play was first produced? Direct students to use the collages to discuss how Australia has changed since 1967–8 and the extent to which changes between 1986 and today might explain different responses to the play. Before reading the play, students are to brainstorm possible meanings of the title. Could it also refer to a way; i.e. a path or journey, a course through life? Among these possible meanings, consider the idea of going away. Ask students to write about and share a personal experience of going away, capturing thoughts and feelings before, during and after the experience. As a class, discuss why people value such experiences. Discuss students’ expectations of what the play will be about. Away is a deceptively simple play. The purpose of the questions below is to encourage students to think beyond superficial meaning to the deeper significance of events. These questions will also foster interest in the ways Gow uses dramatic techniques for particular effects. Summative activities for each act have been suggested with scaffolding questions underneath. Students might be asked to complete a set of questions at the end of each act; class discussion of the answers will help to consolidate knowledge and understanding of the play before students broach the following act. developing a colour/texture palette to create mood. These activities will contribute to a later task that will involve students developing a design concept and statement in which a director sets out their vision of the play. This activity should continue for each act. Why does Gow choose to begin the play with the final scene from a Shakespearean play? What attitudes, perhaps typical of Australia in 1967–8, does Roy reveal in his speech after the school play? What mood is created through the dialogue between Tom and Meg backstage? How does Gwen kill that mood? Compare the responses of the four parents to the school play. What do we learn about each of them? Compare the holidays planned by the three families. What do these plans tell us about each family? Tom curses Gwen’s holiday. Why does he do this? Does the fact that he has just been playing the role of a fairy (Puck from A Midsummer Night’s Dream) add significance to this curse? What do students learn about Coral through her soliloquy? Thinking about Gwen’s comment in the previous scene (She looks awful, poor woman. Her son, you know), can they see any particular significance to her speech? Students could create a comparison table such as the one below identifying the similarities and differences of the three families in the play. Their choice of qualities will be critical in the organising of the ideas in the play. They should write a statement that encapsulates the purpose of this act in the play. What do we learn about Tom’s family in Scene 1? What do we learn about Meg’s family in Scene 2? How is her family different to Tom’s? What explanation does Jim provide for Gwen’s behaviour? What event has occurred in the lives of Coral and Roy? How have they reacted differently? How does Gow use dramatic irony in Scene 4 to show the loving nature of Tom’s family? In this act, there is a sense of otherworldliness and things not being as they seem. Students should begin charting aspects of reality and unreality through the play. Students should consider why Tom’s family is omitted from this act, aside from Scene 5, which shows them protected from the storm. Students can suggest reasons for using departure from reality as a dramatic technique. How do Coral’s two conversations reveal all is not as perfect as appearances would suggest at the Gold Coast luxury hotel? Explain why Coral is so able to see the reality beneath this glitzy veneer. How is Gwen’s nastiness further revealed in Scene 2? Does Jim’s Gone with the Wind story shed any further light on Gwen’s behaviour? Why has the delegation of four campers visited Jim’s site? What attitudes are being satirised through this part of Scene 2? How does Scene 3 show the conflicts in Coral and Roy’s marriage? What threats does Roy make to bully Coral into behaving appropriately? How does Gow stage the storm in Scene 4? What is the effect of the storm on Gwen, Jim and Meg? How does Scene 5 show Tom’s family in contrast with Meg’s family in the previous scene? Ask students to map the emotional high points of this act, identify the climax of the play and justify their choice. They are to answer the questions below as well. How does Gow contrive to bring together all the main characters in this act? Consider Harry’s long speech to Jim. What do we learn about his and Vic’s history? What do we learn about Tom? What evidence is there that Gwen has changed in Scene 1? How can you explain the change? In Scene 2, what discovery has Tom made? Tom says of Coral: I told her a thing or two that helped. She’s ready to get back into the swim, she says. What did Tom tell her that made such a difference? How does Gow add realism to the amateur night in Scene 3? What is Tom’s play, A Stranger on the Shore, about? What is the significance of this play within the play? Explain Gwen’s surprising response to Tom’s play. What is the significance of the stage directions at the end of Act 4, when all characters leave to look at the bonfire except Vic and Harry, who leave in the other direction? Before commencing this act, ask students to speculate on different ways in which the action might be resolved. This discussion will be useful when students are later asked to consider an alternative ending Gow wrote for the play and to write their own alternative endings. Direct them to answer the questions below. Make a list of significant actions and gestures in the Scene 1 mime. Can you explain the significance of these actions and gestures? How is the end of the play like a return to the beginning? What point is Gow making by this cyclical structure? Despite this connection between beginning and end, what has changed by the end of the play? 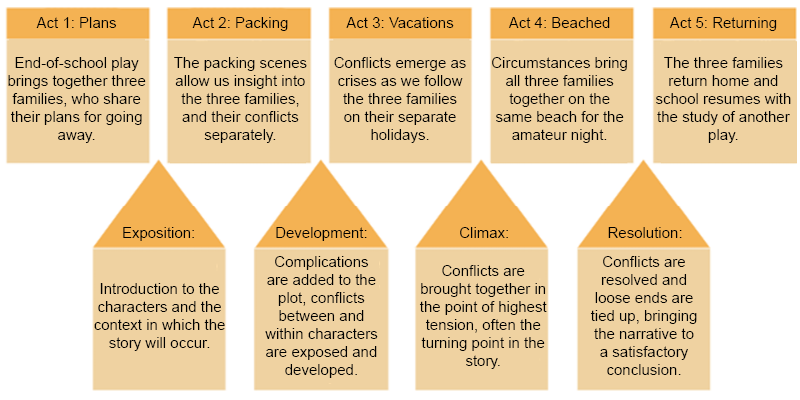 What are the conflicts within each of the three families that drive the plot? In your opinion, what is the climax of the play? How effectively does Gow resolve the conflicts in the play? Draw a graph depicting the rise and fall of tension in the play, with perhaps a separate line for each of the families. Label the graph with key incidents. There are eight main characters in the play: Tom, Vic, Harry, Meg, Gwen, Jim, Coral and Roy. Divide the class into eight groups and allocate one character to each group. The task for each group is to investigate its character by incorporating answers to the following questions into a multimodal presentation to the rest of the class. The focus of the presentation should be the ways in which Gow presents the character through the drama. Describe the character’s relationship with other characters in the play. How does Gow present these relationships through the play? List five key characteristics of the character. Find evidence from the play to illustrate each characteristic identified. What are the character’s motivations? How do you know? Identify one key action by the character in the play and explain why it is important. Identify one key speech by the character in the play and explain its significance. Does the character change or develop through the course of the drama in response to events, or is the character simply further exposed? Find evidence. Create a visual representation of the character that evokes their characteristics. What is the style of the character’s performance? Overall, what role, or roles, does the character play within the drama? Groups should plan imaginatively for their presentations, which might include a brief PowerPoint, an interview in role or a performance of a key scene. All group members should contribute equally to preparing for and delivering presentations, which should run for about ten minutes. To encourage effective listening, the rest of the class could be asked to take notes during group presentations, with a view to writing a response to the essay question below at the end of the task. Students should engage in an imaginative recreation of the story from the perspective of a character by choosing a character of interest. After they have completed the play, they should rethink the story from the perspective of this character. Ask students to relate the story from the perspective of the character, writing either in letter or diary format. In particular, they should express the character’s thoughts and feelings about the ‘holiday’ they experienced. Away is an evocative recreation of a particular time and place, but it also raises ideas of a universal nature. Review the work already done on plot. How does the idea connect broadly to the story? Review the work already done on character. How does this idea relate to particular characters in the play? Find quotes from the play that reflect this idea. Are any images or symbols used to depict this idea in the play? A theme is a statement about an idea. Each group should review its information to propose what statement is being made about the idea. The groups that worked independently on the same idea then meet to compare notes before collaborating to lead a whole class discussion of the idea/theme. Are there other ideas/themes apart from those that have been identified? What do you think is the most important idea/theme in the play? Note that Gow bookends his play with scenes from Shakespeare and incorporates Shakespearean elements throughout the play. To what extent are the ideas/themes inAway also evident in Shakespearean plays you have studied? In her introduction to the Currency edition of the play, May-Brit Akerholt says: . . . like many recent Australian plays . . . Away is about reconciliation and the power of healing through love and compassion. Her comments were written in 1988 but reconciliation is still very much a theme in Australian literature today. Can you explain why there has been so much focus on reconciliation in Australia over the past three decades? What role does drama play in reflecting or shaping the concerns of the nation? Successful plays invariably have engaging stories, engaging characters and engaging ideas, but it is the way these elements work cohesively that defines a great play. Discuss this statement in relation to Away. Ask students to re-read Act 1 Scene 1. Note the contrast between the language used by Shakespeare in the speech by Puck (spoken by Tom) and the language used by the principal Roy in his address to the school community. Under the two headings A Midsummer Night’s Dream and Away, students should make a list of characteristics of the language of each speech and provide an example for each point noted. The colloquial language used by Roy characterises the language used throughout most of the play. Is this language justified? Ask students to find ten examples of colourful colloquial language in the play and explain their meaning and impact in the context in which they have been used. Note that Australian plays have not always used this sort of vernacular language. Ray Lawler’s play Summer of the Seventeenth Doll rocked audiences when it was first performed in 1955, not just because it dealt with confronting ideas and lacked the conventional happy ending, but also because it used the language of ordinary Australians. In many ways, Summer of the Seventeenth Doll represents a watershed in the history of Australian theatre. Ask students to identify any other Australian plays that, like Away, are part of the tradition established by Summer of the Seventeenth Doll. (We have no regrets . . . Act 4 Scene 1). Now students are to look at the language used by Tom in his narration of The Stranger on the Shore at the amateur night (Act 4 Scene 3). They can see he is attempting to use the more formal language that he thinks is appropriate for theatrical performance – perhaps something he learned from Shakespeare when he performed in the school play. At one point he starts to use the word pissed and then quickly corrects himself and instead saysdrunk. This more formal language is comically undercut by the interjections of the audience and the antics of Tom and Coral hamming it up – clearly Gow wants to keep his play grounded. However, the heightened language does lend an added significance to this play within the play, so that when Coral declares at the end I’m walking, I’m walking, first in role and then in her own voice, the audience is acutely aware that she is referring to the fact that she is now able to move on from her dire situation, from the mental and emotional rocks on which she has been foundering. Any consideration of language in the play cannot overlook Act 5 Scene 1. This scene is a mime and yet it speaks volumes about how the characters feel at this emotional point in the play. Ask students to discuss the significance of the actions and gestures performed in this scene. In many ways, actions and gestures are more powerful ways to express feelings than words – perhaps in drama actions and gestures should be viewed as simply aspects of a broader notion of ‘language’. Discuss with the class the idea that a play is simply a script for a stage production. When we study a play we should attempt to see a production of the play or produce the play for the stage ourselves. At the very least we need to take time to consider the dramatic techniques utilised by the playwright to present characters and ideas on stage. Ask students to discuss how these elements are used in different ways in plays already studied or productions already viewed by the class. Students should locate examples of these dramatic elements in Away and explain how they contribute to the meaning of the play. After students complete the table, ask them to share responses. To what extent are dramatic techniques prescribed by Gow’s stage directions and to what extent are directors free to interpret the play as they wish? Richard Wherrett’s introduction to the Currency edition, The Play on the Stage, may be helpful at this point. Overall, how effective are the dramatic techniques used by Gow? Which scenes did you find particularly effective? Would you describe Gow’s style as naturalistic or stylised? Or does he use elements of both? Compare the use of these dramatic techniques in Away with other plays you have studied or viewed. Two members of the group will act parts and the third will direct. Provide groups with time to experiment with interpretations and rehearse before they perform for the rest of the class. Performances do not require costumes and can be book-in-hand, but performers will need to stay in role and speak or move appropriately. the class discusses the effectiveness of the group’s interpretation and execution of the scene. One group member should direct while others act. Actors could use costumes or props as required. Music and lighting could be added if these facilities are available. Reviews are valuable texts because they represent different perspectives of different productions of a play. They remind us that each production is unique, reflecting a particular director’s interpretation of the play and the capacity of the production team, including but not just restricted to actors, to realise that interpretation. And then of course different reviewers can view the same production and arrive at quite different opinions. Divide students into groups of about 6. Provide each group with copies of reviews referenced at the end of this unit, or if students have access to laptops provide them with URLs so they can find them online. Read the two reviews of the 2006 Queensland Theatre Company production of Away or the two reviews of the 2013 University of Adelaide Theatre Guild production. What similarities do you notice between the two reviews? What differences do you notice between the two reviews? How can you account for different responses to the same production? Now read any two reviews of different productions of Away. What can you learn about the different ways in which the directors of the two productions interpreted the play? Which aspects of the productions are emphasised by each of the reviewers? Are there different areas of emphasis? Which is the most positive review of the two? Quote words or sentences to support your response. Does a more positive review mean that the production reviewed was better than the production that attracted a more negative review? 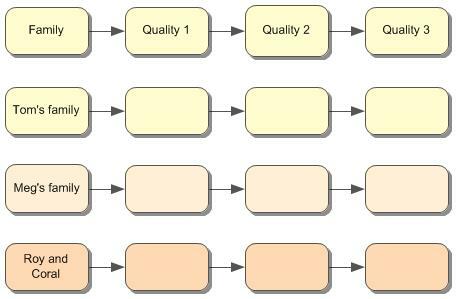 After scanning several reviews, choose the one that you believe was the most successful (as distinct from the most positive review). Justify your choice. What are the qualities of a successful review? Have students read the alternative ending to the play developed by Gow for a later production of Away. What is different? What is the dramatic significance of this change? Does this change enhance the impact of the play? Students should explain their views. Students are to write their own alternative ending to the play and explain how this ending would affect the meaning and impact of the play. Away begins with the final scene of A Midsummer Night’s Dream, the play performed at the end of the school year. The Mendelssohn music, composed in the nineteenth century for A Midsummer Night’s Dream and used for the school production at the start, pervades Gow’s play. Tom, who plays the part of the mischievous fairy Puck in the school production, puts a Puck-like curse on Gwen that comes true in Away. Rick’s attraction to Coral seems to draw him out of his real world into a ‘dream’. Fairies wreak havoc in A Midsummer Night’s Dream and also whip up the storm in Away. The storm is pivotal to the action of the play, as in Shakespeare’s The Tempest. Coral arrives at Tom’s beach in disguise, a commonly used device in Shakespearean comedies. Gow uses the device of a play within the play (The Stranger on the Shore), just as Shakespeare does in Hamlet, A Midsummer Night’s Dream and other plays. Away consists of three interwoven plots, an approach used by Shakespeare to add interest and mayhem in his comedies, including A Midsummer Night’s Dream andThe Tempest. The play concludes with the start of King Lear, when the teacher asks Tom to read Lear’s opening lines. At one level, this intertextuality serves a comic purpose, as Shakespearean allusions seem so out of place in the world of the play, which is after all so commonplace and so familiar. However, further investigation of the links between Away and Shakespeare’s plays reveals a serious purpose behind this intertextuality. The following questions, designed to explore this intertextuality, may require students to undertake some rudimentary research into Shakespeare’s plays, particularly his comedies. Why did Gow choose to begin his play with a scene from A Midsummer Night’s Dream, rather than some other Shakespearean play? In what ways is Tom like Puck, the character he plays in the school production? Who or what causes the storm in The Tempest? How does Prospero use the storm to his advantage? Compare this with the use of the storm in Away. In several of Shakespeare’s comedies – such as A Midsummer Night’s Dream, The Tempest and As You Like It – characters temporarily move ‘away’ to other lands. Why does Shakespeare contrive these moves? Can you see a further link withAway? regeneration leads to greater happiness. Are any of these thematic elements evident in Away? Ask students to research the following dramatic genres, in particular noting the main characteristics of each genre and examples of plays that illustrate the genre: comedy, tragedy, magic realism, satire. Then ask students to identify which label best fits Away. Or is Away a combination of these genres? The Australasian Association for Theatre Drama and Performance Studies (ADSA) is the peak academic association promoting the study of drama throughout our region. Students are to imagine ADSA has decided to create a Drama Hall of Fame to recognise significant dramatic works of exceptional quality. Away has been nominated for induction. Provide students with time to discuss this proposal in groups before writing a submission to ADSA arguing why they think Away should, or should not, be inducted to this Hall of Fame. Hold a class discussion of dramatic purpose and how it is achieved. Now consider the dramatic purpose(s) of Away. Compare with other plays seen or studied. How effectively does Gow use language and dramatic techniques to achieve his purpose? Ask students to consider this quote from the play and then write an essay in response to the question that follows.Miss Latrobe: I thought I’d bring you all out under the trees to read this, in my opinion, Shakespeare’s greatest tragedy. Now there are many who would give Hamlet pride of place, but it is the struggle between man and nature, as well as between man and man, and between man and himself that makes this, for me, his masterwork.Miss Latrobe is referring to King Lear in this statement.To what extent does it apply toAway? Has Gow written a tragic masterwork? whether Gow uses language and dramatic techniques with sufficient effectiveness to ‘speak’ to modern audiences. Do they think that Away is dated, and therefore mostly of historical interest, or does it still speak to audiences today? In their responses, they must refer to ideas in the play as well as Gow’s use of language and dramatic techniques. Before getting started, students have prepared the groundwork for this assessment task by working on a concept and design statement. Considering the promotional material prepared for other productions of Away, also listed in the resources at the end of this unit. Note that this assessment task could be completed individually or in groups. If students work in groups, the teacher will need to consider individual contribution to group work for the purposes of assessment. Before a play is produced and rehearsed, there needs to be a clear idea of what the play is about (its plot and its themes) and how it will look (sets, characters, style). This vision can be articulated quite formally in a concept and design statement – a concise but precise statement which allows others to envisage the director’s intention for the production. Students should prepare promotional material for the production to be placed on the website of the community theatre group. Their aim here is to sell the production to the community. MICHAEL MURRAY taught English in NSW public schools for 27 years, including 11 years as Head Teacher English at Lucas Heights K-12 Community School. Subsequently he worked for seven years as the Chief Education Officer, English and Literacy, in the state office of the NSW Department of Education and Communities, managing (and participating actively within) a small team that developed resources and provided professional learning for teachers K–12. That position was cut in a recent restructure and Michael has now been working freelance as a consultant in the areas of English and Literacy teaching and learning, particularly in collaboration with the NSW English Teachers’ Association and the Primary English Teaching Association Australia. Michael was also the Supervisor of Marking for the Higher School Certificate English Extension 1 course 2006–2010 and has had many years experience lecturing teachers and students on Higher School Certificate English electives and texts. In his spare minutes, Michael reads novels and poetry, views films and writes.